Tom initially joined the Centurions on a one-year deal from Wigan Warriors in October 2013 after making a big impression at LSV during two seasons as a dual registered player. 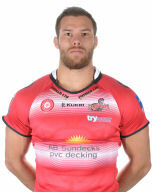 He made seven Super League appearances for Wigan and also played under dual registration for South Wales. Tom played a key role in the Centurions winning the Northern Rail Cup in 2013, scoring a try in the 43-28 final victory over Sheffield Eagles at Halifax. The former Wigan St Patrick’s ARL junior and BARLA Under-19s international missed the end of the 2014 season after suffering a bad knee injury but fought his way back to full fitness and was a regular in 2015. An ambassador for Leigh Community Trust, Tom is an outstanding professional on and off the field.